In high school, I was a weekly subscriber to the satirical news feature, Sandwich Monday. Written by the humorists of National Public Radio’s Wait Wait … Don’t Tell Me!, the staff would choose an obscure, seasonal, limited edition or experimental food item (often times from a fast food joint), and talk about what it was like to eat it. We give the staffers of the original Sandwich Monday full credit (and many thanks) for the inspiration behind this article. The segment is now finished, — their last article was titled “We’re Full” — and so I figured somebody oughta carry on the torch. 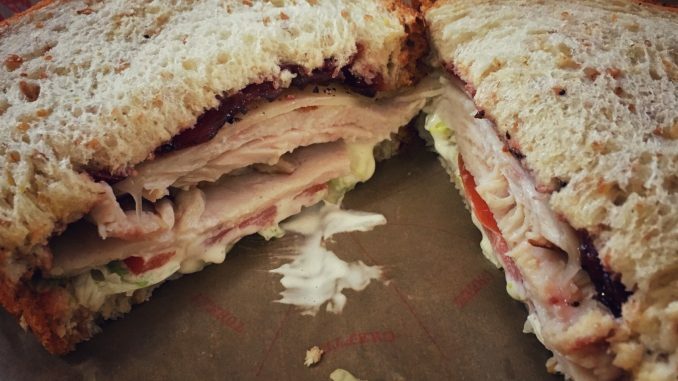 It’s a matter of civic duty, really — someone has to eat these sandwiches. And so here we are, eating sandwiches (mostly) and telling you how it makes us feel with as much candor as possible. November is the time when we give thanks. At Arby’s, that means giving thanks for deep fryers and mayonnaise, apparently. 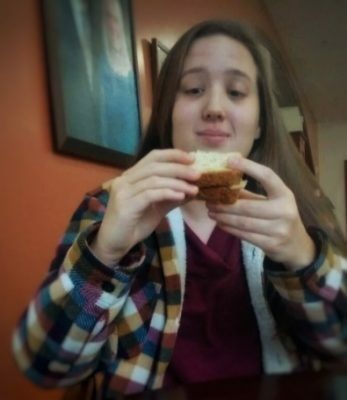 Features editor Jess Behrman and I sat down for some quality time with the sandwich in the Kellogg Center last week to see what all the hype was about. This is what we learned. Evan Rieth: It’s funny, I don’t remember my elementary school teachers telling me about how the Native Americans went out and harvested that year’s crop of Gobblers for the first Thanksgiving. Jessica Behrman: Oh, well deep frying everything is purely an American invention. ER: This is perfect for Black-Friday shopping because I’ll need to eat away my buyer’s remorse. JB: Noted. I’ll take that into consideration if I ever go Black-Friday shopping. ER: *reading menu description* Oh, good, they remembered to capitalize Deep Fried Turkey—it’s easy to forget Thanksgiving’s patron saint. Ladies and Gentlemen, please raise your ketchup packets in a toast to DFT. ER: I like the way they put the little bits of meat in the bread, too, so that I know there’s more meat coming. JB: Those are wheat berries. ER: I like the way the cranberry sauce gives me just enough sugar for the energy to take another bite. JB: Agreed, but this cranberry sauce tastes more like jelly. I feel like I should be eating it with peanut butter. Maybe if I flip the sandwich upside down so I don’t taste the cranberry sauce first it will make a difference. ER: They’ve kept the Thanksgiving theme for vegetables as well: Only for decoration. Get off of there, tomato. JB: What kind of vegetables are you eating at your Thanksgiving? I never see lettuce or tomatoes on my table. I think green bean casserole or mashed potatoes would be a good side. JB: The only thing that looks like it went through a “lawn machine” is the lettuce. ER: “The Gobbler” is also one of Edgar Allen Poe’s long-lost poems. It’s basically “The Raven,” but the main character just eats a sandwich and falls asleep, so it never gained too much traction in the literary world. ER: Arby’s website says that “The Gobbler might make you wonder if Thanksgiving should’ve been a month-long celebration.” That’s mostly because if you eat one you won’t wake up until the end of November. JB: Forget the apple, Evil Queen, use the Gobbler on Snow White. ER: I think I lost it, but there must’ve been a paper slip in here about not operating heavy machinery after eating. Also not safe for children under five. ER: Delicious. Best recommended for those living in climates where a 5,000 calorie/day diet is necessary to stay warm. It’s one of the few foods with enough grease in it to keep from freezing. JB: It’s not normal “fast” food. I feel like it’s almost up to Panera standards.